Dan Learns Stuff: Bench Power Supply Complete! 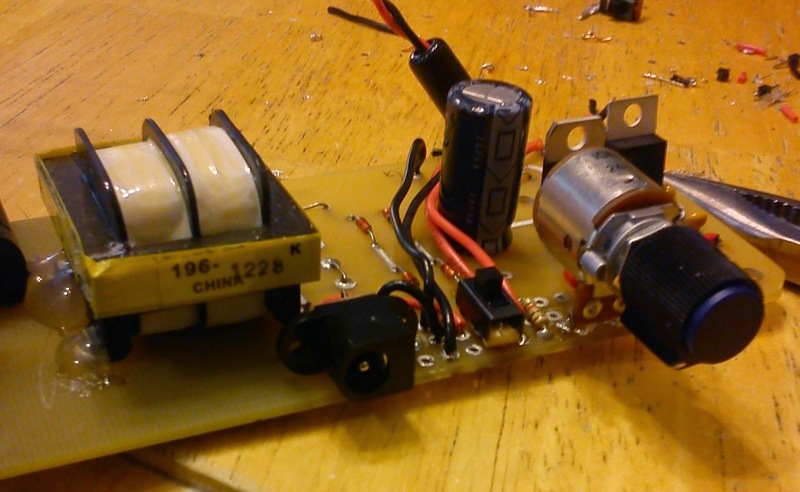 Thanks to SYN Shop, the Las Vegas Hackerspace, I completed a bench top power supply. I took a class that helped me build one from a kit. The kit itself produced a 5v out and a configurable out that I ended up making 8.5 for Arduino. One of the challenges of the class was to take that kit and enhance it. I removed the resistor on the configurable channel and replaced it with a 10K Ohm potentiometer from Radio Shack. This allows me to configure it for between 2 and 14.5 volts! Some time later, I got tired of the alligator clips I used to connect to the two rails. I replaced them with a barrel connector and switch. My initial schematic was woefully flawed, however. If I had completed it, I would have shorted the rails to ground through the switch, blown the fuse, and possibly smoked the voltage regulators. Yeesh. Thanks again to SYN Shop and Javid, the teacher who's kit made this possible.